I was so excited when Will Forrest of Graze reached out to me and asked if I would review a bin of their Vermont fresh food. I am not one to pass up farm fresh food. So, what is Graze? 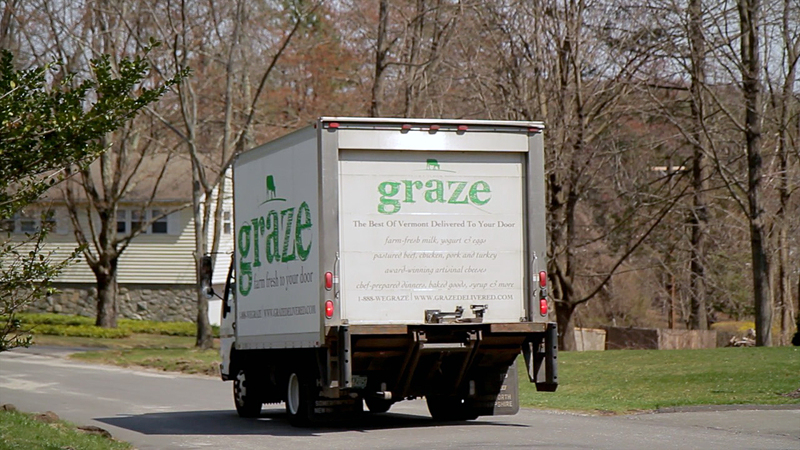 Graze is a weekly farm-to-fridge online delivery service which brings fresh and sustainably produced foods directly from Vermont family farms to your front door. You can get grass fed meat, cheese, eggs, milk, bread, pantry staples and chef prepared "ready to heat or cook" meals. They source from small family farms and everything is traceable back to it's source. Graze delivers every week, year round. There is no membership fee and no delivery fee. You only pay for the food you order. For Connecticut folks the process is simple: You order what you want online each week by Thursday at midnight. Your food will arrive at your door Monday morning. They currently deliver to most of Fairfield County, eastern Westchester County and the western suburbs of Boston. In Connecticut, they are looking to expand to the New Haven area and to northern Fairfield County, i.e. my neck of the woods in Danbury. Check out the quick video interview I did with Will when he dropped off my goodies. Onto my bin of goodies. Will put together an order for me so I could review a variety of items. There was: a quart of Monument Farms whole milk, a dozen Maple Meadow Farms eggs, cinnamon raisin bread by Klinger's Bread Company, cherry yogurt from Green Mountain Creamery, one of Graze's ready-made Weekly Quinoa Salads with a vinaigrette dressing, a ready-to-cook "One Skillet Meal" with Stonewood Farm sweet Italian turkey sausage, farfalle, veggies and Parmesan cheese, and last but not least, a ready-to-heat "Dinner For The Kids" of chicken teriyaki and veggies. As you'd expect the milk and eggs were great. When it comes from small farms you just can't go wrong. The yogurt was refreshing and not too sweet (which I really like). It was tangy and paired nicely with a touch of homemade granola for breakfast. 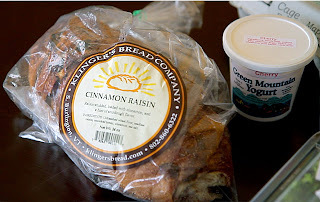 Unlike my husband, I can't say I'm a hug fan of cinnamon raisin bread. However, this one hit my taste buds just right. We toasted a few slices and hit 'em up with a little butter and hot sauce (I know sounds crazy but don't knock it 'til you try it). I liked the idea of the One Skillet Meal. No measuring, no chopping required. Everything is portioned out and it comes with an instruction card. It's super easy and for folks on the run I could see this as a great go-to when you're tired and crunched for time. The veggies were fresh and crisp. The sausage had a nice flavor. Overall this was a really good meal. I feared it would be bland, but it really wasn't. If you wanted to kick it up a notch, not that you need to, you could easily toss in some crushed red pepper flakes or dried herbs from the pantry. 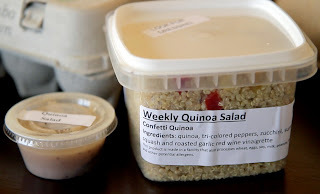 The ready-made quinoa salad made a nice hearty lunch for the two of us. The ingredients were simple, fresh and the vinaigrette dressing brought everything together. This kind of item is perfect for a healthy lunch, ready to go. 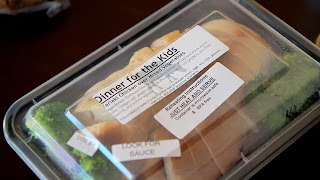 The ready to heat "Dinner For The Kids" was designed with picky eaters in mind. It was basic cooked chicken, a few broccoli florets, as well as a few cooked peppers and squash strips. All you have to do is re-heat it and pour on the teriyaki sauce. This was decent, but not my favorite. The teriyaki was a bit too salty for me. And, for my taste, there was too much meat and not enough veggies. But hey, it was healthy and made with quality ingredients. While this meal was just OK, I'd still be interested in trying some of their other ready to heat meals. I'd still rather have this on hand than other prepared processed foods that's for sure! Overall, I give Graze a thumbs up. 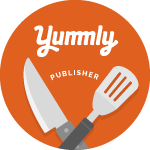 It's fulfills a niche and offers people a seriously easy way to eat healthier and more sustainably. No, it's not local, but it is regional and the travel miles are certainly less than anything people find in a regular supermarket. If it gets people to make better choices and support small, sustainable farms I'm all for it. Oh, and it's delicious stuff! If you're interested in learning more about Graze or signing up just head on over to their website. And, if they don't already deliver to your area, let 'em know. In addition to the usual Graze line-up, they also offer a Summer CSA with organic produce from local Vermont farms. They work with a co-operative of farms, so Will promised the CSA won't overload you on any one item. After all, there's only so much zucchini one family can eat! For information on the CSA click here. 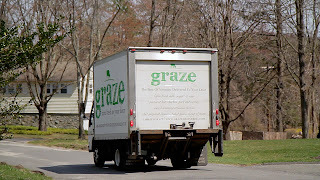 Have you tried Graze or a similar kind of service? What do you think of it? Disclaimer: I was not compensated for this post. I did receive all of the above mentioned food free of charge (approximately $90 value). The opinions contained herein are my own and reflect my experience with the products. Your own may differ.